Competitively Priced MPP Round Type capacitor from Reputed makes like L&T, Epcos, Schneider, Subodhan, Prabodhan etc. Fostered with rich industry experience and knowledge, we are engaged in providing a wide range of Subodhan Capacitor. Subodhan's High voltage capacitors are manufactured using latest design i.e. film foil designed, extended foil construction with edge soldering and edge folding of electrode foil. Large units up to 300 KVA in single container can be offered giving the benefits of KVA to volume ratio thereby reducing installation cost and space. 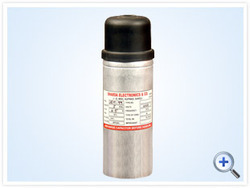 - Capacitor are also available in mpp type, app type, gas field type etc.